We’re one of the best and prominent providers of the luxury and modular kitchens within the country. Eight Streaks has continuously refined and innovated its fantastic product range to give the best of the best solutions to the consumers. We’re probably the most reliable brands to get complete kitchen design solutions and components like appliances, accessories, hardware, shutters and lots more and Whole of Interior solution like wardrobes, Tv units, Crockery units for Dining area, Foyer area, Storage units, Study units, Computer tables and Shoe rack. Eight strekas is the most recommended brand for luxury and modular kitchens in Hyderabad India. We make the best – Whether it’s modernizing your whole kitchen, or upgrading modular kitchen interior design or components of your existing kitchen, we do the entire process to build your kitchen easy and hassle free. Just from the measurement and installation of and modular kitchens in Hyderabad, our team puts their 100% to make your kitchen extremely beautiful. We take small stages in this process with our finest kitchen interior service in Hyderabad India. Make kitchen of your creative thinking – It’s not mandatory that our designs and ideas will match all of your desires and requirements. Therefore, we offer luxury kitchens Hyderabad, India just right from your imagination. Regardless if you want complete makeover or require partial installation. We respect your emotions and creativity. In the end, you’re the only one who’ll be using it in future. Your opinions, suggestions, ideas and inputs will help in the transformation of the customized kitchen. Consequently, our specialists are always ready to turn your ideas into a required output. We provide the finest customized modular kitchen services in Hyderabad, India. Our modular luxury kitchens Hyderabad is popular because we offer the most excellent and affordable services. We’ll calculate, design, craft and finally install the final product easily. Our goal is to offer you a smart looking kitchen design in Hyderabad India. Hence You’ll get a promise of usability and beauty. Hyderabad as fastest growing market for modular kitchens and there is a lot of demand for state-of-the-art kitchens which combines aesthetics and functionality to bring to the modern consumers the best product. Providing the customers with the best functionality by using the renown brands of Kitchen accessories and hardware. 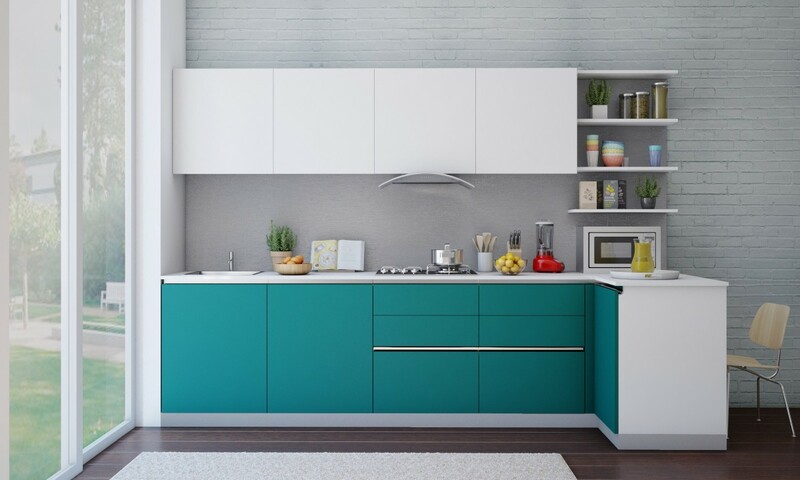 Brands like Hettich, Hafele, Ebco and Sleek by Asian paints are used to suit the needs of the customers giving the ease of operation and enough space utilization in the Kitchen. This Chimney has Inclined Hood Glass & Steel Fusion Design with Innovative Touch Interface. This Chimney comes with a Elegant Fluorescent lamp, Touch Control & 3rd Generation Auto Clean (Dry). It’ s noise level is very low, which is 56 dB. Modular kitchen dealers in Hyderabad.Eight streaks Interiors has competed its 5years milestone in the year 2018 with Serving more than 150 clients in various reputed projects all over Hyderabad. Bajaj twister fruity mixer grinder runs on powerful motor and has tetra-flow technology which ensures proper mixing and grinding and with 2 years warranty on product and 5 year warranty on motor.Motor is of Copper with high performance. This mixer grinder comes in very appealing color and best in Quality and Value for money in the segment of Mixer grinder with the juicer jar. Product has 100 percent copper motor with full efficiency and Cooper motor gives durability compared to other brands. Interior designers and decorators in Hyderabad.We provide 2bhk and 3bhk, villa Interiors, and Interior design and decor services in Hyderabad. Our Products and Services includes Modular Kitchen, wardrobes and all the wooden furniture manufactured in Our factory and fixed at the site. We deal in different range of products to provide the customer end to end solutions. Small Appliances-Mixer grinders, kettles, Geysers and all the small appliances and Electricals. we are authorised dealers for Prestige, Bosch, Bajaj, Hafele, Ebco, Hettich and Many more reputed brands. We are Authorized Diatributors for Kutchina kitchen appliances. We have wide range of Imported Wallpapers with more than 10000 collection to choose from, hence best available options to choose from. Wallpapers store at Ameerpet, Hyderabad. Wallpapers are available at our store and Interior wallpapers are to decorate walls to give the aesthetic feel and ambiance to the rooms. They are of non-woven, Vinyl, for hall, Kids, beds, floral and Abstract designs. Eight streaks Interiors deals in wallpapers of 1000’s of models with unique designs and catalogs. Wallpaper comes in rolls and Each roll would come with a width of 2feet or 4feet with 59sft area of Coverage with the range starts from Inr.3000 to Inr.6000. Installation Time : Each roll would take around 1/2hr or 45 min max. Plan your wallpaper before 7days of your requirement to match the interiors and selection and stock availability.Most of the stock would be available Immediately. Russeta 4B Brass burner hobs from Kutchina.It is a premium company Known for its Quality products which are aesthetically Appealing and Best technology in its appliances to give the best experience to the customers.It was launched at a price of 16,990.00 INR best possible price in this category.It brings the technology with Indian brass burners with low consumption of gas due to 3 element burner design.